Louisville, KY – Alice Lloyd College professor Megan Burnett, in association with HerStory Productions, will be bringing two performances of Shame the Devil! 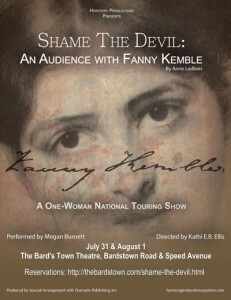 An Audience with Fanny Kemble to Louisville audiences. Burnett will present this dynamic exploration of this 19th century actress and early icon of the anti-slavery movement at The Bard’s Town Theatre on July 31st and August 1st at 7:30 PM. Tickets are $15.00. Shame the Devil! An Audience with Fanny Kemble uses the one-person show format, a play form that Kemble herself undertook in the 1850s, to explore the life, theatrical work, and literary endeavors of this idiosyncratic and passionate Englishwoman. A member of the leading family of Shakespearean roles in early 19th century England, Kemble came to this country to tour and left the stage to marry Pierce Butler. Subsequently discovering his family had large plantation holdings, Kemble found herself living on her husband’s plantation – and face to face with the daily workings of the slave system. Her Journal of a Residence on a Southern Plantation was embraced by the early anti-slavery movement. This script, taking Kemble’s journal as inspiration, offers a complex glimpse of all these facets of Fanny Kemble’s life, providing the performer with an opportunity to become English and American characters, men and women, slave and free, and to embody Shakespeare’s greatest creations. She has performed this production twice at ALC as part of the College’s Caney Convocation Series. Director Kathi E.B. Ellis re-unites with Megan Burnett for this second revival of a production that has toured Kentucky, Florida, South Carolina, and Oklahoma. Ellis and Burnett are long-time collaborators, having worked together with the Pleiades Theatre Company (including Eve Ensler’s Necessary Targets and the NEA-funded original work Alice Moments: Echoes, Ripples, and Light) and the ShoeString Productions’ site-specific production of The Glass Menagerie. They are also two of the founding co-principals of StageLab, an acting studio offering ongoing training for theatre artists. Megan Burnett has acted professionally throughout the Commonwealth and the country and has extensive Shakespearean credits as both performer and teaching artist. At Alice Lloyd College, Burnett serves as Assistant Professor of Speech and Theatre and has directed many main stage productions for the College, including The Musical Comedy Murders of 1940, Antigone, Through the Looking Glass & What Alice Found There, The Best Christmas Pageant Ever, Smoke on the Mountain, Much Ado About Nothing, Waiting for Lefty, Museum and Liza and the Riddlin’ Cave. She also created and directs The ALC Alfred and Shirley Wampler Caudill Players, a student acting ensemble, which performs for area schools, community centers and nursing homes. In the community Burnett is a board member for Jenny Wiley Theatre and serves as an Advisory Council member to the Cumberland Mountain Arts & Craft Council for The Little Shepherd of Kingdom Come production. She was an English Speaking Union Teacher Scholar studying at Shakespeare’s Globe in London and a participant in the Japan Fulbright Memorial Teacher Fund Project in which she studied the educational system (K-College), as well as Kabuki, Noh and Bunraku theatre forms. Burnett has also studied with Shakespeare and Company, and has been the voice and text coach for the Josephine Summerstage Shakespeare productions for the past two summers. Additional information about Shame the Devil! An Audience with Fanny Kemble can be found at herstoryproductions@yahoo.com. The original production was produced with support from the Kentucky Foundation for Women with additional support from the Kentucky Arts Council with state tax dollars and federal funding from the National Endowment for the Arts.